Strength is important but it is the climbing technique that makes great climbers. When you begin focusing on the right technique, the climbing starts getting easier. The climb that looked impossible at the first sight gradually starts giving you hints as you start climbing with right moves and techniques. Climbing techniques include the ways to use your feet and hands, tips to maintain balance, and ways to be more efficient while climbing. You have to master the footwork, grips, handworks, balance, and deliberate moves to perform these moves and techniques. Like many new climbers, are you on your way to mastering rock climbing? Here, I have mentioned most common basic and advanced rock climbing and bouldering moves and techniques to help on your way to mastering the climbing. Edging is a basic and crucial rock and indoor climbing technique. Many climbers consider edging as the most important footwork as climbers have to use this every time while climbing. While climbing, you will come across small footholds frequently. As your entire shoe does not fit on the foothold, you have to place your toe tip or external/internal edge of your climbing shoe to support your body weight. Usually, you perform edging with the inside edge of your climbing shoe. Likewise, if you need to move sideways along a wall, then the outside edging comes into play. While edging, you will push your body to find the next handhold or give your body stability and plan your next move. For this technique, you need to have strong feet, enough practices, pressure on the right part of the foothold, balance, and shoes that offer stability. You will not get footholds for every step while rock climbing. You will come across just rock slab or vertical wall with no any support for your feet. Then, this is when climbers use smearing. Smearing is a technical way to pressing your climbing shoes sole directly to the surface of the wall to gain the friction to move upward. You have to apply pressure to your toes which in return pushes your waist and body out from the wall. For smearing, you need to have more flexibility, creativity, and a natural sense of balance. With the right smearing technique, you can quickly advance upwards even through the steep and vertical terrains. Flagging is another basic technique that helps you make a smooth climbing. Flagging lets a climber counterbalance the body with the free-hanging foot. It helps you evenly distribute your weight on both sides of your body. The purpose of flagging is to proceed for the next move, reach further or higher, or avoid swinging out from the rock. There are most commonly two kinds of flags – rear flags and side flags. In rear flags, you put the free leg behind at nearly 90 degrees to your standing leg. Climbers use rear flagging to move to the opposite direction of their firmly holding hand and foot. Likewise, while side flagging, climbers flag their one foot straightly and push the foothold with their other foot. Stemming is a technique used by climbers in dihedrals and corners of rocky walls. In this technique, the climber pushes one wall with one foot and uses another foot to push against another wall. Climbers use this whenever they find a narrow gap between two faces of walls. You can use this technique even in the smooth walls with no any foothold, jug, or a crack. You rely heavily on friction that your feet produce against the wall. As you do not have handhold to pull yourself up, the technique relies completely on pushing force. You push the wall with your hands and feet to gain the oppositional force and move further upward. While stemming, you may find footholds or jugs which you should use to make stemming easier. Let me introduce you one of the most underrated moves of rock climbing – the bat hanging. Bat hanging is a move that only a few climbers of high rank can achieve. As the name says, you hang upside down from the wall using only toes of your feet. Most climbers mark this move as a difficult one. But, with a lot of practices, you can master this move too. To perform this move, there should be a steep wall with a large hold to hang from. The jug or hold should be large enough to fit your both feet. There are a few things you should consider while attempting a bat-hang. You should place the edge of the hold right above your toe joints. Toe joints are the strongest and most stable part on the top of your foot. You need to position your legs perpendicularly with your feet and toes and make them straight and tensed. Climbers use bat hang move to rest their arms. And sometimes, climbers come across a situation where they need to climb through a jug with their feet first and then proceed for grabbing the next hold with their hand. The process in this situation is just like a double-toe-hook move. Lay-backing is a technique that climbers use on the cracks, corners, and flakes. In this technique, your feet and hands work in opposition to each other. You slightly push the wall with your feet and pull your body by holding the crack or arêtes. While performing a lay-back, focus on keeping your arms straight and moving up with your feet. Make sure you distribute the weight of your body evenly. Put both hands in the crack of the wall in a side pull position with thumbs facing each other. Also, make sure you place the hands at comfortable positions – one at the chest level and another just a little above your head. And be careful not to alternate the high hand while moving your hands. Since lay-backing involves your legs, arms, and the core of your body. So, you need a proper rest before and after lay-backing. Mantle is another move that many climbers find challenging. It involves the pulling force at first and then the pushing force subsequently. Performing mantle is just like coming out of a swimming pool. Mantle involves four major movements. At first, you bring a foot up and then use your arms to pull yourself up. After coming at a balanced position, you press the surface with your palm to get your belly button above the surface you are trying to climb. There are two types of palm presses in the mantle; hand-in and hand-out. Hand-in palm press involves rotating your hand inward which helps you gain stronger initial push with the help of your shoulder and tricep. In hand-out press, you rotate your hand outward that helps in great positioning as you do mantle. Then, you take the hand a bit farther from the foot and roll your shoulder over your hand. Then, you will step up with another foot to conclude mantling. Mantle is a hard technique that beginner climbers get scared of. They find it quite intimidating. But, climbing itself is intimidating too. So, you need proper practices and commitment to master this amazing climbing technique. Undercling is a climbing technique with bicep-intensive movements. While performing this move, you face your palm up to use a hold. Many popular climbs around the world need this technique. So, undercling is a useful technique for climbers. While performing undercling, you grab the upside-down hold with your finger. Your palm faces upside and the thumb points away from your body. You use your hand to pull your body outwards from the wall and you use your feet to push the wall and stay on the wall. There are a few things climbers consider while performing undercling. You have to align the middle section of your body with the handhold for a good balance. The undercling requires both body tension and counter-pressure. If there are footholds, then undercling becomes easy. 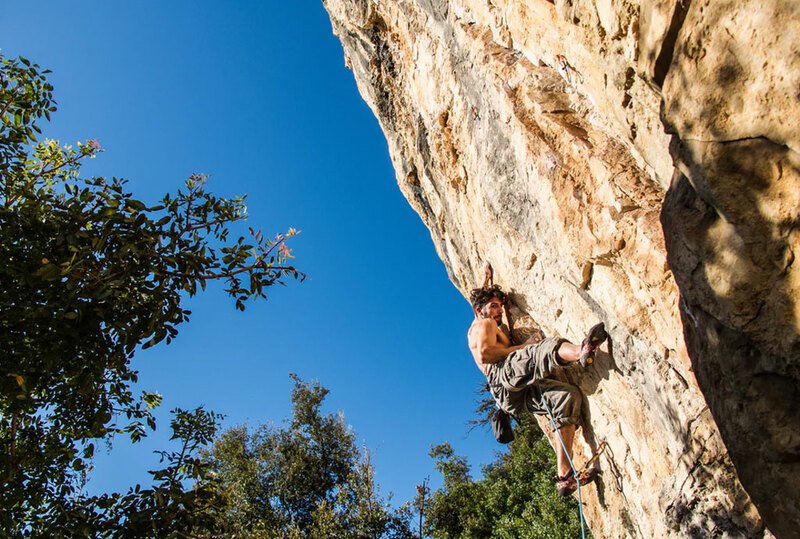 If there are no footholds, then you may have to combine smearing technique with undercling to continue climbing towards your destination. Drop Knee is a classic move in which you spin your hips towards the wall and drop down your knee. While doing this, you keep both feet on the footholds but let one knee drop down as you twist your legs. Some climbers prefer calling it back step as well. Drop knee helps to raise the sidearm higher than the other arm as it shifts the weight of your body towards the other arm close to the wall. This helps in setting up a powerful lock between your legs. So, this technique helps you control the stability and tension in steep-angled walls. There are a few reasons why climbers perform drop knee technique. Employing this technique helps you reach the distant holds. It keeps your body weight on your feet and saves energy. It also helps in gaining stability and generating upward motion. Cross Through is a basic move that you can learn within a minute. When we climb, we use our left hand to grab the holds that are on our left side and we use the right hand to grab the right sides’ holds. Sometimes, you may have a strong hold only on your one hand (say left) and the next hold is somewhere further left, then you may have to use your right hand to grab the next hold. We call this cross through in climbing. Sidepull is another basic move that beginner climbers can learn quickly. A sidepull is a hold that you use to move yourself sideways. You face sideways instead of upwards facing to perform this move. While performing this move, you have to shift your body weight to keep the balance. You grab the hold and pull it sideways to move yourself sideways instead of upwards. Once you get familiar with side pull move, you will have so many holding options all around you. Palming is to hand as smearing is to feet. While palming, you use the similar technique that you use while smearing. The only difference is you use your palm to press against the blank wall/rock while you move your feet to another position. The counterpressure to the smooth surface lets you remain stable even if there are no proper edges and holds. Palming can be very useful when you have no good handholds around. You may also have to use it while stimming if there are no good handholds available. You can also use it on corners by palming on both sides. The counterpressure of pushing against the surface lets you remain in balance even at smooth and clean surfaces. Many climbers consider dyno as an insane move. The move requires a good amount of energy and quickness. When the next handhold is too far to reach, climbers make their arms straight, and keep their hips close to the wall. Then they leap upwards to grab the handhold that they would not reach by stretching their arms. Scary and fun – Dyno is one of the most amazing moves in rock climbing. Climbers use the momentum from their dynamic motion to grab the next hold. So, we call them “Dyno”. To perform this move successfully, you require core strength, precision and control. You have to leap in such a precise way that the jump is not more or not less than the required one. As you leap to grab the hold, the additional momentum your body creates by the jump makes it harder to grip well. So, you need grip with more strength. The heel hook is a popular move among all kinds of climbers from beginners to the prominent ones. Climbers usually use heel hook while climbing the arête, ledge, or top of the wall. While performing this move, you place your foot on the hold or ledge. Then, you push the hold or the ledge with your heel while you pull yourself up with your hand. Heel hook transfers a lot of your weight from the arms to your feet. So, it helps to save the strength of your arms for other arms-intensive moves. Toe Hook is somehow similar to heel hook. The difference is you use the heel of your foot to push yourself in heel hook move, but you use your toe to pull yourself up in the toe hook move. In this move, your one leg acts as the third hand. You can hook your toes on a hold and then use your hands to grab the next hold. Climbers use this move in places like the roof a cave which helps them avoid swinging their legs and thus help remain stable. Double toe-hook move looks similar to bat-hang move. But climbers use their hands as well to grab holds. The lock-off is a common climbing move that does not have any dynamic movement involved. While performing this move, climbers pull themselves up until their arm is in a bent position. Then they hold that position with their body tension to reach the next hold with their free arm. You move slowly and precisely while doing the lock-off. Although the move looks like an easy one, it still requires some practices. You require strength and coordination to perform this move. You should learn the way to hold and release the lock-off position. Gaston is to arm as stemming is to feet. Gaston is a type of grip in which a climber pushes the rock slab or the hold outward instead of pulling in. Sometimes , you may come across holds that are facing towards you. In other words, when there is a vertical or diagonally located hold, then you have to go for the gaston technique. While performing gaston, climbers use their one hand with the thumb down and elbow out. This helps them press the hold outward and maintain the friction. As you grow in your climbing, you will find yourself employing many of these moves and techniques. These moves involve all your body parts, good footworks, amazing handworks, relaxed grips, balance, and deliberate moves. You need to practice them a lot to master them. Make sure you practice these moves and techniques with safety and under the guidance of trainers. Did we miss anything that you wish to see in this article? Let us know and we will consider your idea.